In a previous post, I discussed some possible distinctions between excellence and success, and why schools should aim for excellence. When success is defined only by the end results, it doesn't honor the process and how not all aspects of our "success" are within our control. I think about the Olympic athletes who will compete in Rio in just a couple of weeks. Not all of them will be successful as competitors there. In fact, someone is going to finish last in every single event. But clearly, these are excellent athletes. At least I can't imagine any of these elite athletes not demonstrating courage, heart, determination, hard work, and discipline. One would expect every Olympic athlete must exhibit these qualities just to make it to the games. These are qualities that embody excellence. But in spite of their excellence, not all of these athletes will experience the same level of success. The same is true of teaching and schools. Sometimes, we do our best work in situations that may not appear to result in outward success. Below are a few quotes that capture the spirit of excellence I am seeking to describe. For students, educators, and schools, a new school year is filled with possibilities. However, we can't always control our level of success. But we can control our level of excellence. "Excellence in education is when we do everything we can to make sure they become everything they can." "Excellence is not an accomplishment. It is a spirit, a never-ending process." "Excellence is to do an common thing in an uncommon way." Question: How will you demonstrate excellence as an educator? 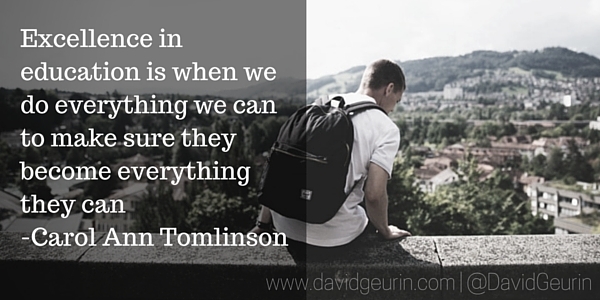 How will inspire your students to strive for excellence? I want to hear from you. Leave a comment below or respond on Twitter or Facebook.